Strange things are afoot. Town squares are busy again. Kids are gathering at libraries in the middle of the night. You might wake up to find a crowd of people outside your house. Someone might even knock on your door, asking to come inside to catch a monster. What is going on? Pokémon Go, available for the iPhone and Android, is the smash hit of the summer, and it’s already the biggest mobile game in U.S. history. Since its launch on 6 July 2016, it already has more daily users than dating app Tinder, more daily users than Twitter, and more engagement than Facebook. The Pokémon franchise has been going strong for 20 years now, having begun on Nintendo’s Game Boy portable console. In the primary Pokémon games (there have been spin-offs in various genres), your character travels the land, collecting “pocket monsters,” called pokémon, and uses them to battle other pokémon trainers. With Pokémon Go, the series enters the realm of augmented reality, or AR for short. In contrast with virtual reality, which uses devices like head-mounted displays to isolate you from the real world, augmented reality blends the real and virtual worlds (for more on VR, see “On the iPhone, Virtual Reality Is Unofficially Real,” 17 June 2016). Instead of situating gameplay in a fantasy world, Pokémon Go bases its landscape on Google Maps, and instead of controlling your character with a d-pad or joystick, you move around in the physical world to play, which explains some of the strange behavior I mentioned above. How Pokémon Go Works — One thing that makes the game so popular is that as you play more, you can become engaged with some rather deep game mechanics and strategies. Several guides to the game have already been created, so I’ll explain just some of the basic vocabulary and gameplay here — enough to get you going or understand what others are talking about. The objective of the game, such as it is, is to use pokéballs to collect all the pokémon you can — 150 in total — make them more powerful, and use them to fight other pokémon trainers. But how you play is up to you. Many people treat Pokémon Go sort of like birdwatching, with a focus on collecting pokémon, whereas for others the game revolves around battles and gaining control of gyms, which I’ll explain shortly. Like most online games of this type, there is no way to “complete” Pokémon Go; you play the game until you’re tired of it. To play, you must either link the app to a Pokemon.com or Google account. However, the Pokemon.com servers have been overwhelmed, so most players have been forced to use Google. This caused some early controversy, as Google reported that Pokémon Go had full account permissions, which made users think that the game’s developer, Niantic, could access players’ Gmail accounts, calendars, contacts, and anything else linked to Google. Enterprising security expert Dan Guido performed a deep analysis of what the game was able to access and discovered that the security concerns were overblown (Engadget has a full write-up of the drama for those interested). In short, Niantic could read “biographical information” like your email address and phone number, but Google confirmed that they couldn’t access more private data, like your email messages. Although the permissions drama was overblown, Niantic responded quickly with the 1.0.1 update, released on 12 July 2016, which fixed the problem entirely, instead requesting just appropriate permissions. If you already had Pokémon Go installed, 9to5Mac explains how to ensure that the app’s Google permissions are downgraded. The main thing you’re looking for is pokémon to catch. In the screenshot below, I’m playing the game in Walmart. At the left, I’m watching the circle around my character, because it indicates what I can interact with, three pokémon in this case. When I tapped the tan Pidgey to try to capture it, the screen at the right came up, showing the Pidgey facing me. By default, Pokémon Go uses your iPhone’s camera to show your actual surroundings with the pokémon superimposed on them. However, you can turn off this “AR mode” with a switch in the upper right, which makes capture easier. To catch a pokémon, you swipe on the screen to fling “poké balls,” which act as traps, at the pokémon and try to hit it. Some pokémon are hard to hit, and some may escape even after you capture them in a poké ball, forcing you to catch them again. Once you catch one, it goes into your collection, which is accessible via a menu. 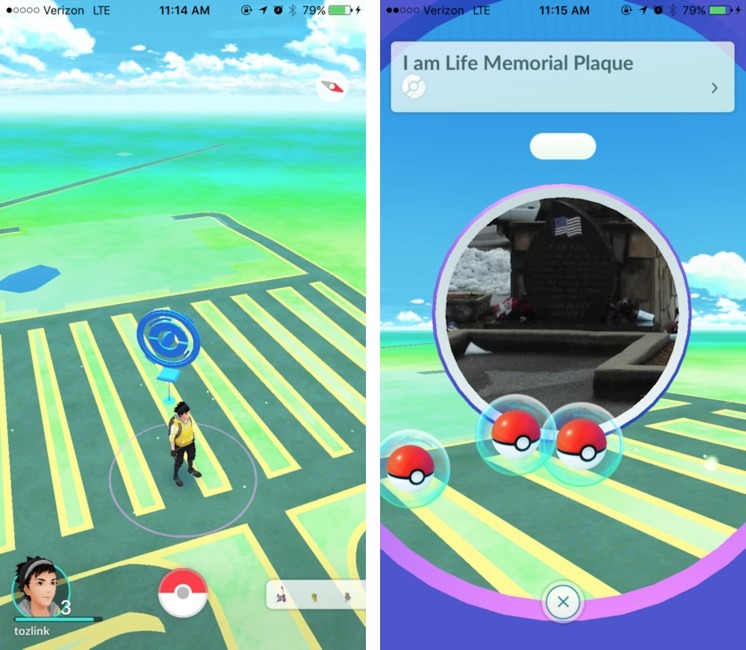 You have a limited number of poké balls, but you can get more at “pokéstops,” which correspond to Google Maps places of interest, like churches, parks, and landmarks. Go to a pokéstop, spin the wheel (the blue circle at left below), and then tap the poké balls to collect them (I got three poké balls in the screen at right below). You can also acquire other items at pokéstops, like eggs that hatch random pokémon. Another way to stock up on poké balls is by leveling up, which you do naturally as you play the game. Every time you catch a pokémon or visit a pokéstop, you gain experience that goes toward your next character level. As you gain levels, you see different pokémon, which are more challenging to catch, and you gain more gameplay opportunities. At level 5, you’re prompted to join one of three teams — Team Instinct, Team Mystic, or Team Valor — and gain the opportunity to compete against others in gyms. Pokémon Go’s endgame, to the extent it has one, revolves around these “gyms,” which, like pokéstops, are found around landmarks (mine is in our town’s square). In gyms, you pit your pokémon against other players. Defeat enough rival pokémon and you gain control of the gym for yourself and your team. Gyms are also the only place, apart from in-app purchases, to obtain “pokécoins,” the game’s currency. Finally, you can use in-game items to power up or advance your pokémon. You can make weak pokémon evolve into more powerful forms. For example, Pidgeys are weak but extremely common, but you can turn them in to get Pidgey Candy (each pokémon type has a specific candy used for power ups), which you can then use to convert a meek Pidgey into the more powerful Pidgeotto. More candy enables you to make a more powerful Pidgeotto or evolve a Pidgeotto into a Pidgeot, the highest form of Pidgey. If you’re confused, the simple lesson is to catch any pokémon you see because they all have some value. For example, the nominally useless Magikarp (which is basically a very stupid goldfish) can evolve into the mighty Gyarados (a powerful water dragon). Now that you have the gist of the game, I can explain some of the strange behavior you may have witnessed recently. Unexpected Consequences of AR — Developer Niantic is no stranger to the augmented reality genre. While Niantic was owned by Google before its 2015 spinoff, the company produced an AR game, called Ingress, that was a precursor to Pokémon Go. But while Ingress was a success, it has nothing on the tens of millions now playing Pokémon Go. With that kind of scale, we’re seeing some interesting implications for AR, both good and bad. On the plus side, it’s making people leave their homes and go out in public. Kids and adults alike are getting out, taking walks around town (hatching eggs requires movement), hanging out in town squares, going to libraries, meeting new friends, and discovering new real-life places, all thanks to the allure of catching pokémon. Like anything, people can take it too far. Two of my wife’s friends went on spontaneous road trips to hunt pokémon: one to Cincinnati and another to Georgia, both driving out of Tennessee! Niantic probably didn’t anticipate such expensive and ecologically damaging behavior. Other problems could have been anticipated, if not avoided. 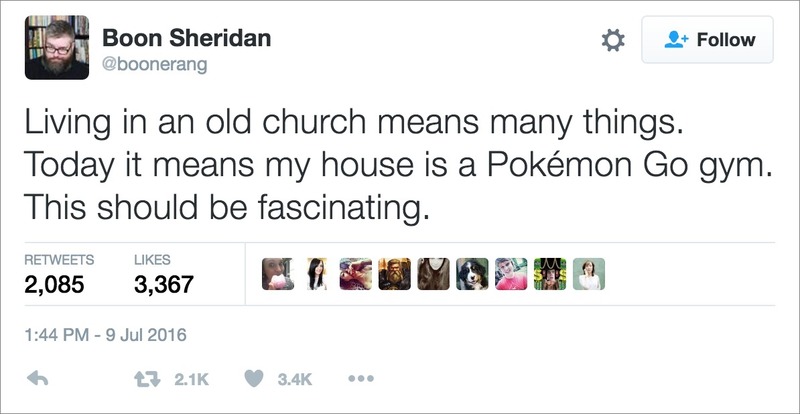 Boon Sheridan lives in a converted church, but because it’s still listed as a point of interest in Google Maps, it was designated as a pokémon gym. He now regularly has a crowd of players outside his house. But things get even weirder. There’s reportedly a gym inside the Pentagon, and the Radford Army Ammunition Plant apparently contains some desirable pokémon, leading to an increase in trespassing incidents as players try to get close enough to catch them. Pokémon Go players have had to be discouraged from playing the game at the 9/11 Memorial, Arlington National Cemetery, and the United States Holocaust Museum. Yikes! The news surrounding Pokémon Go is a mix of the good, the bad, and the weird. Two marines playing the game helped catch a murder suspect in Fullerton, California. A teenager playing the game in Wyoming discovered a dead body in a river. 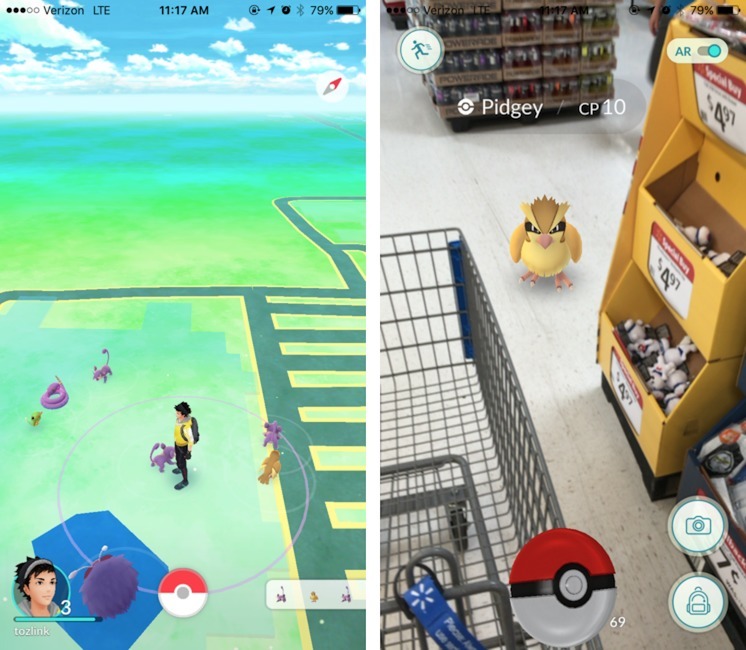 Pokémon Go can be a boon for small businesses, who are using it to attract customers. On the downside, robbers are using the game to lure victims. 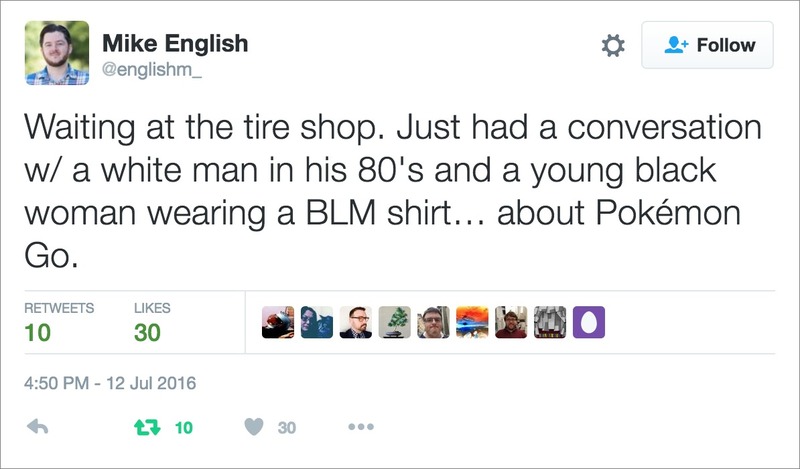 It’s helping to bridge racial divisions, but also reminding others how real they still are. On the more mundane front, there are entirely valid concerns about people playing Pokémon Go while driving, which the gameplay sort of encourages. I think it’s more fun to play with a designated driver, which is often my role, but I’ll admit to making more than one fast U-turn to help my wife catch a pokémon that we passed. At this point, Pokémon Go is more than a game, it’s a cultural phenomenon that raises numerous questions about the modern world in which we all live. 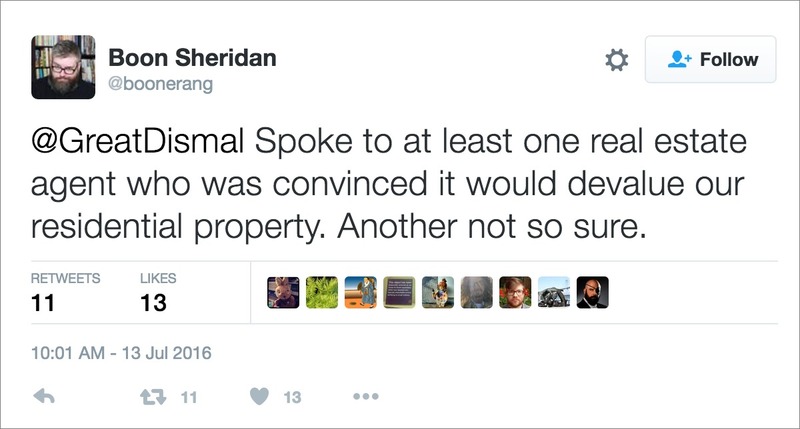 In the meantime, Boon Sheridan is just trying to figure out what it means for his property values. Is This AR’s Big Moment? — AR isn’t new, but this is the genre’s first big hit. Does Pokémon Go mean that AR has gone mainstream? There are arguments on both sides. Let’s be realistic: Pokémon Go is such a success in large part due to the popularity of the 20-year-old Pokémon franchise. The aforementioned Ingress was similar, but no one would call it a cultural phenomenon. However, it would also be disingenuous to ascribe Pokémon Go’s success merely to the popularity of the franchise. The Pokémon Company, the consortium that owns it, could have slapped out a truly dreadful mobile game, and, while it might have been commercially successful, it wouldn’t have been the smash hit that Pokémon Go is. Pokémon Go’s success has come from the convergence of multiple factors. The gameplay of the video game series, in which you travel the world hunting pokémon, is a perfect match for AR. The game’s use of GPS and cameras couldn’t have been developed before the widespread usage of smartphones. It also helps that Niantic has experience building this exact kind of game and that it was released in the dog days of summer, when kids are out of school and need something to do. And, frankly, it hasn’t hurt that the mainstream news media are desperate for some light human interest stories rather than those about divisive politics or mass murders. Of course, Pokémon Go could just be a flash in the pan. The public may tire of how Pokémon Go impinges on the real world, encouraging erratic driving and hordes of kids roaming the streets at night. Worse, a tragedy caused by a distracted Pokémon player in the wrong place at the wrong time could cause a backlash. Even if no one actually dies playing the game, a steady stream of odd behaviors and media overexposure could sour the public on the concept. Also, it’ll be interesting to see how eager people will be to hunt pokémon in the dead of winter. In the meantime, if you’re sick of hearing about the whole thing, the Pokemon NO! extension for Google Chrome aims to filter all references to the game from your Web browsing experience. 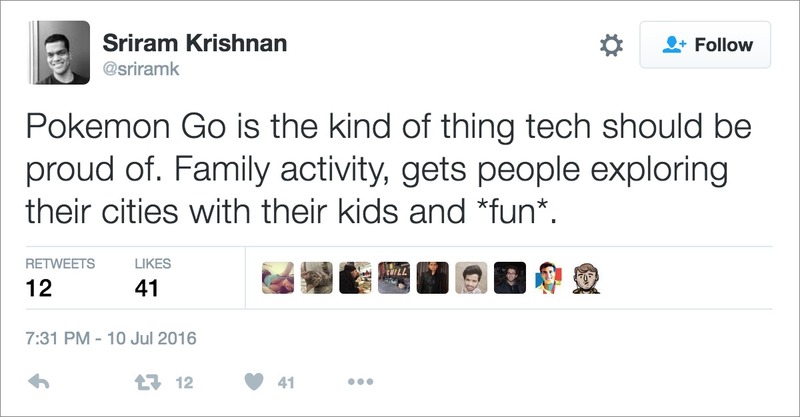 For most of us, though, Pokémon Go is just another example of how weird the future is. Comments About What the Heck Is Pokémon Go? Mr. Centers; Thanks for this explanation, you're a mind reader! I had seen plenty of headlines about this but stuck my head in the sand til your article came around. Interesting how so many popular games have to do with violence though, but that's another topic. What I wish you would have explored, is what data mining is going on by the developer or google or game licensor. Like, are they tracking people and saving the images from their cameras, as well as why in the world would they put these monsters in places like solemn locations? Are they encouraging debasement? it's an interesting societal phenom/study. Oh, and how do you pronounce the thing? The data mining thing is a good question, but there's no way to know for sure what they're collecting. I would say GPS data at the very least. Pokémon Go gets full access permissions to some Google accounts. I learned my nephew was a beta tester while on a trip to Disneyland/California Adventure last month. I thought Americans were supposed to be overworked. Where do people find the time to do this stuff?